Back in 1963, my Aunt Annie, who was at that time 90 years old, gave me a recipe she had gotten from her mother for an unusual cake she learned to make as a child in Germany. 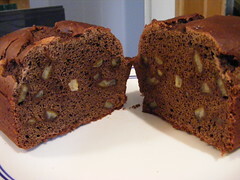 She called it Kriegskuchen, which translates as “War Cake”, and it was called this because it’s easy to make and does not require butter, or eggs, or oil, which are in short supply during a war. And for those of you on a low-calorie or low-fat diet, or for those with an egg allergy, this is just what you were looking for. My mother made this cake often during the year all through the 60’s and 70’s, and especially around Christmas. The flavor of the standard recipe is very Christmas-like, but the recipe is very flexible. I have continued the tradition for many years, and I’ve experimented a lot with variations on the original recipe. Around Christmas I bake and ship these cakes in various flavors to my friends and my kids, and I thought I’d share it here. All of these cakes are baked in a standard bread pan. The recipe I got from my aunt was all in grams but my mother converted it all to more convenient units right from the start. Mix together all the ingredients except the milk then add the milk and mix with a spatula until everything is wetted. 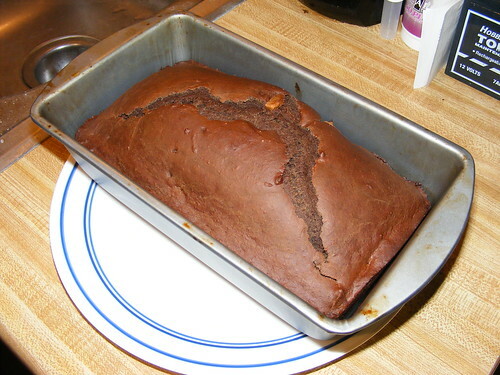 The batter is quite thick so it takes some effort to fold and mix. The moisture content of flour varies so sometimes you need to add a tiny bit more milk. 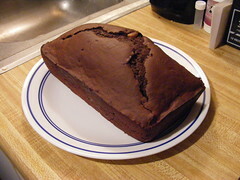 There should be no dry flour or cocoa visible. Then scoop it all into a greased breadpan and bake at 350F for one hour. Remove from oven and allow to rest for five minutes, turn out on a cake rack to cool off. Next we can get creative and have some fun with this cake. If you want a super chocolaty cake add one cup of chocolate chips to the original recipe, or add one cup of peanut butter chips, or 50/50. Adding a teaspoon of vanilla changes the taste. Omitting or reducing the cloves changes the taste. Or, we can substitute other fruits for the currant/raisins. Elsewhere in my blog you will find a recipe for candied orange peel. Candied orange peel (and you can add quite a lot) combined with the chocolate makes a heavenly flavor. If you really want to go crazy add candied orange peel and chocolate chips. Wow. Or, we can omit the cocoa. For this variation, omit the cocoa, reduce the milk to one cup, and be sure to add one or one and a half teaspoons of vanilla. You can add just about any candied fruit you like. About one cup does the job. My son-in-law’s favorite is a version made with candied pineapple and no cocoa. For this, I purchase cans of small diced pineapple wedges and I candy them the same way as the orange peel recipe elsewhere in my blog. Have fun with this low-cal, non-fat cake. Depending upon the ingredients, calorie count for the whole cake varies from 1,400 to 1,800 calories except for the super chocolaty version above that comes in around 2,900 calories.